The U.S. bank prime rate remained unchanged over the second half of June, at 3.25 percent. Only one of the nearly 50 credit card offers tracked by this survey changed in the latter part of June. That relative quiet contrasted sharply with interest rate activity on the bond market, where yields on ten-year Treasury bonds climbed sharply in the second half of the month. The steadiness of credit card rates could be chalked up to the lack of movement in the prime rate, which has not changed since January of 2009. 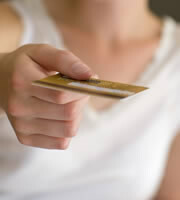 Traditionally, several credit cards have tied their rates to the prime rate. However, there must be more to it than that, because the prime rate is not the only thing that affects credit card rates. After all, there is a cushion of more than ten percent between most credit card rates and the prime rate, and the size of that cushion has varied from time to time during the four-plus years that the prime rate has been unchanged. One reason for the muted reaction in credit card rates is that they dropped much less than Treasury yields in response to the Great Recession and its aftermath, so they don't have as far to rise now that the economy seems to be strengthening. From the end of 2007 to the end of 2012, 10-year Treasury yields dropped by 2.83 percent. In contrast, the average credit card rate nationally dropped by just 1.57 percent. Part of this is because credit card companies have different concerns from Treasury bond investors. Credit card companies have to be concerned with credit risk, which increases as the economy weakens, and decreases as the economy strengthens. As a result, credit card rates may reflect a greater cushion against defaults when the economy is weakest, which would run counter to the normal cyclical pattern of interest rates. That could explain why credit card rates have been more stable through the bad and the good phases of the economy in recent years. Consumer non-rewards credit cards represented the only category to change in the latest survey. As a result, the spread between rewards and non-rewards rates narrowed slightly, to 2.43 percent from 2.47 percent. This spread represents the potential extra cost of participating in rewards programs for people who have to pay interest on a credit card balance. Student credit card rates were unchanged in late June, and have not moved since late February. While the category overall has held steady, students should be aware that there is generally a wide range of rates represented by different student credit card offers. Those students with time on their hands during summer vacation might do well to take the opportunity to shop for better credit card terms. Both business non-rewards and business rewards credit cards showed no changes in late June, making this the fourth straight survey in which both were unchanged. The increase in consumer non-rewards credit card rates only affected one rate tier of one credit card offer. Since the rate tier that increased was for consumers with top credit records, this meant that the spread between the average rate for consumers with excellent credit and those with average credit narrowed by 1 basis point, to 4.09 percent. This spread represents the potential extra cost for consumers who have some black marks on their credit histories. 0 Responses to "Consumer credit card rates inch upward"